SVP David Pinette Co-Hosts the HR Department of the Year Awards November 15 | Challenger, Gray & Christmas, Inc.
Join The Philadelphia Media Network, publisher of The Philadelphia Inquirer, Daily News, and Philly.com for the HR Department of the Year Awards, a program giving recognition to HR Professionals for what they do and the growth and change they produce within their organizations. 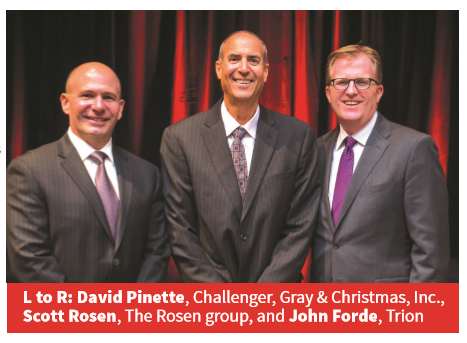 Founded in 1998 by Scott Rosen, President of the Rosen Group, the program is now in its 20th year and continues to be a successful attribute in the HR Industry. Selected finalist have been reviewed by an outside panel of judges. Applications for the 2018 Awards program represent some of the region's most notable and respectable companies who are dedicated to building change, contributing to innovation, and dedicated to growing their organizations. Program to include networking with food and beverages, panel discussion, and awards program. When: Thursday, November 15, 5:30 p.m. - 9:00 p.m.